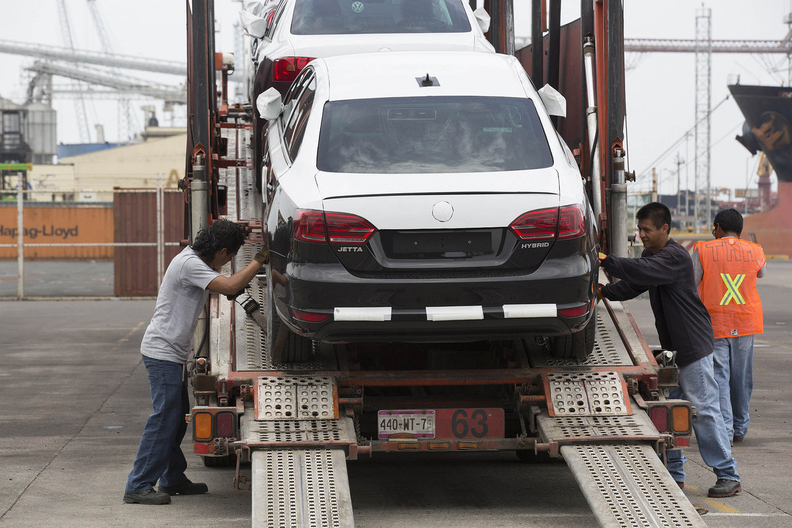 Workers load Volkswagen Jetta cars onto a car carrier at the Port of Veracruz in Mexico. Demand for cars in Mexico is getting a boost from record-low inflation, cheaper credit and the government's crackdown on illegal used-car imports, according to industry reports. MEXICO CITY (Bloomberg) -- In Mexico’s red-hot domestic auto market, even embattled Volkswagen is doing well. Demand for cars in Mexico is getting a boost from record-low inflation, cheaper credit and the government’s crackdown on illegal used-car imports, according to industry reports. Carmakers are adjusting to the brighter outlook. Mazda Motor Corp. is boosting production for Mexico to meet the rising demand in Latin America’s second-biggest economy, Keishi Egawa, CEO of the Japanese producer’s local unit, said in a telephone interview. "We definitely want to produce more than in 2015," Egawa said. The company’s plant in Salamanca built more than 200,000 vehicles last year, he said. In addition, when companies such as Honda Motor Co. couldn’t export some Made-in-Mexico cars to struggling economies in 2015 due to low demand, they chose to sell them to flush Mexicans, Guillermo Rosales, executive director of the dealers association, known as AMDA, said in an interview. Several factories have modified production plans for this year to account for more sales in Mexico, he said. VW declined to comment on Mexico’s sales figures and triggers for lower sales worldwide. Honda didn’t return voice and email messages requesting comment. In the latest monthly auto report, Mexican production climbed 4 percent while exports fell 5.9 percent after shipments to Brazil and China floundered. In that same November report, Volkswagen sales climbed 13 percent. That compares with a 25 percent drop in the U.S. after the automaker stopped selling diesel-powered cars following reports it used software to cheat on U.S. emissions tests. One analyst, however, said Mexico may become a victim of its own success. The boom in local sales is increasing infrastructure bottlenecks at highways, rails and ports, and those snags are already weighing on exports, said Armando Soto, president of Kaso & Asociados, an auto industry consultant in Mexico City. While Mexico’s light-vehicle sales have soared, they’ve also done so in the U.S., by 5.6 percent last year through November. In addition to a rallying domestic sector, VW is being helped in Mexico by brand loyalty, Rosales said. The company has sold cars in the nation for half a century. It began building the iconic Beetle in 1967 in Puebla in what’s become the biggest standalone plant making VW brand cars outside Germany.